Artificial disc replacements (ADRs) are mechanical devices that are designed to preserve movement when a spinal disc segment needs surgical attention. This surgery is normally due to a disc herniation that compresses a nerve but there are other disorders that can have indications for an ADR (bone spurs or mild degeneration). These ADRs work by attaching to the bone of each endplate of the vertebra. The “internal structure” of the disc is the bearing surface and this is where artificial discs all differ. This bearing surface can be metal on plastic, metal on metal or a polymer cushion (a bushing-similar to a shock absorber in a car). These artificial disc replacements are simple mechanical devices that can wear out or fail like any other mechanical devices. Failure can occur from wear of the bearing surfaces or failure of the bonding between the metal and bone of the vertebra. Occasionally, the bone can be too soft to support the artificial disc and the metal surface can erode or fracture into the bone. The secondary restraints (the facets) have to be functioning and intact to make sure the internal workings of the disc will function as they were designed. If the facets have already failed (by erosion of the cartilage or erosion of the bone), the artificial disc will be prone to failure. Are you suffering from symptoms of a failed cervical artificial disc? You can see an example of this by the pictures included here. This patient came to me after having a fusion of multiple levels in the neck. The level above the fusion had broken down and the patient developed a degenerative spondylolisthesis (a wearing of the facets allowing the vertebra above to translate forward on the vertebra below). This wear precluded the patient from having an artificial disc in my opinion as the stress that would be applied to this artificial disc would be too great to allow this disc to have longevity. The patient wanted an ADR no matter what the circumstances and finally found a surgeon in Germany to implant this disc. This artificial disc lasted about one year before the disc broke down and malfunctioned. You can see the pictures of this eroded disc here one year after implantation. Without the intact facets to protect the disc, the plastic bearing surface of artificial disc wore down. This wear of the plastic surfaces created small debris-like particles that triggered the immune system into action. The white blood cells tried to ingest these particles and ultimately destroyed the bone that the metal of the disc rested on. The attached video also notes another mode of erosion failure mode. This patient had a good initial indication for the artificial disc surgery and underwent surgery at another institution. Over time, due to increased activity, the disc fractured into the vertebral body. This displacement misaligns the two bearing surfaces and causes the disc surfaces to become incongruent. Pain and reduced motion is noted. Revision of an ADR in the neck can be generally easily accomplished by converting it to an anterior cervical decompression and fusion (ACDF-see section on this website to better understand this procedure). Revision of a lower back (lumbar) ADR is more difficult as the approach through the abdomen (belly) is much more difficult in the face of scar from the prior surgery already used to implant this device. Most patients are happy with this cervical revision surgery and the success rate is high. To learn more about failure of cervical artificial discs, please contact the office of Dr. Donald Corenman, spine specialist and neck doctor serving the Vail, Aspen, Denver and Grand Junction, Colorado area. 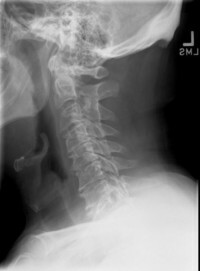 (Click to Enlarge) Lateral cervical X-ray. Note that the discs have lost 80% of their height making ADR success poor. (Click to Enlarge) AP prior to surgery Note scoliosis (curve from front to back) and rotation of vertebra which will cause problems with implantation. (Click to Enlarge) AP X-ray post implants Note that the discs are implanted off center and scoliosis causes lateral tilt The patient developed C5 radiculopathy after implantation due to foraminal stenosis due to increased mobility. (Click to Enlarge Image) This is the lateral X-ray of a patient’s neck. She had a pervious three level fusion of C4-7. She has subsequetly worn out C3-4 and wants an artificial disc replacement. She is not a candidate as she has a slip of C3 on C4 (black arrow and red lines). (Click to Enlarge Image) This X-ray lateral demonstrates the step off of C3 on C4 with neck flexion. The red lines should touch each other and not be displaced. (Click to Enlarge Image) This is an image one year after her artificial disc replacement performed in Germany. The disc has failed. The white arrow points to bone loss. The black arrow points to the disc eroded into the endplate. The red arrow point to malalignment. (Click to Enlarge Image) This X-ray demonstrated flexion of the neck with the failed artificial disc. The large white arrow points to bone loss. The small arrow points to malalignment, the black arrow to erosion of the bone. (Click to Enlarge Image) This is an AP X-ray of a normal Maverick artificial disc replacement in good alignment. (Click to Enlarge Image) This is an X-ray of a failed Maverick artificial disc replacement. You can see the disc alignment is not parallel and the spacing (black arrows) is asymmetric. (Click to Enlarge Image) This is a lateral X-ray of the samed failed artificial disc from a side view. The arrow points to erosion of the disc into the vertebra and the two lines point to the disc alignment and bone alignment. These lines should be parallell to each other. (Click to Enlarge Image) This is the revison fusion of this failed artificial disc into an ACDF (anterior decompression and fusion.